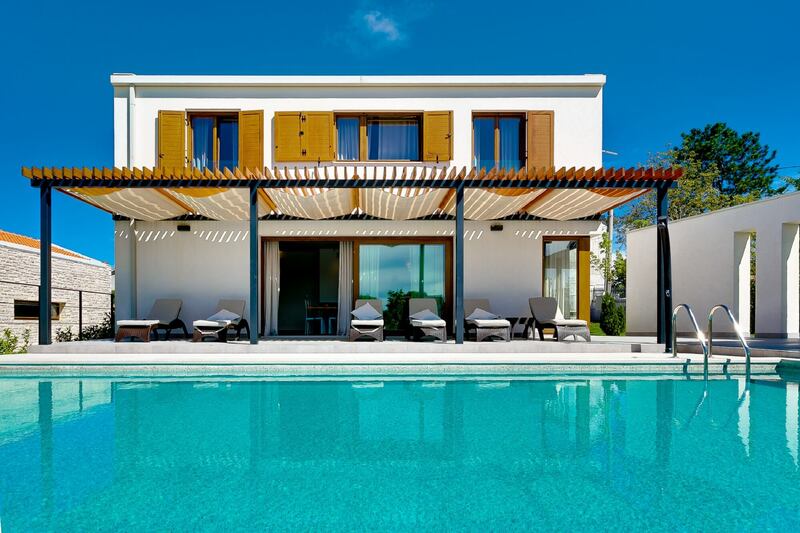 This beautiful, luxurious, new built villa is located in a small hamlet of Sv. Petar u Šumi in central Istria, in the beautiful ground in a group of 5 villas. Villa Gialla is stark white, minimalist, and contemporary. The great room opens directly onto the pool garden, with covered outdoor living areas. There are dining area for six, fully equipped kitchen, and lounging areas. The indoor dining area boasts a double sided fireplace opening to the living area on the ground level, further opening to the terrace. The kitchen is modern and fully equipped with microwave, fridge, freezer, coffe machine and dishwasher. The three bedrooms are on the upper level. One bedroom has double bed and en-suite bathrom and the other bedroom with double bed is devided by slide doors of the other bedroom with bunk beds . Villa Gialla is luxury air conditioned villa that offers wifi, satellite TV, DVD players, washer, high chair and baby cot. It offers privacy in a convenient location for enjoying everything that Istria has to offer; sunbathe on white pebble beaches, admire medieval architecture, tour local vineyards, and sample our world-renowned olive oil.